Want to buy a latte with your fitness tracker? If you use an American Express credit card, now you can. Today, AmEx announced a partnership with Jawbone that it claims will make it the first wearable fitness technology brand to accept mobile payments. Jawbone's new Up24 retails for $199 and lets American Express cardholders pay for things by tapping the bracelet against payment readers in stores. 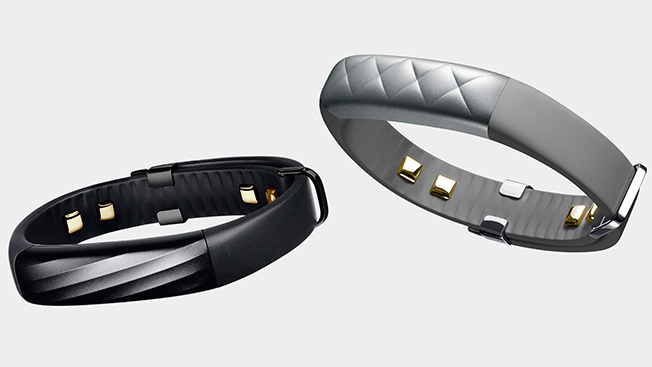 The tracker has an NFC—or near field communication—chip that syncs with a new app Jawbone will launch this summer. After downloading the app, consumers log in with the same password and user name they use on AmericanExpress.com. From there, they pick the right credit card to transfer money to the Jawbone. On the opposite end of the brand spectrum, AmEx also partnered with McDonald's last year to let diners pay for meals with reward points. When you swipe your credit card at the cash register, the screen shows how many points you've earned. Clicking through finishes the payment, and 100 points is worth $1 of free food. The program also links with American Express' mobile app. Similar to the McDonald's program, AmEx members can swipe their credit cards in 7,000 New York cabs. Once a rider chooses to pay with a credit card, a prompt on the checkout screen shows how many reward points are needed to pay for the ride. Last year, the financial company inked a deal with the ridesharing app so that loyalty program members can pay for their rides using reward points. Uber's deal also lets people double their reward points by booking their ride on the app. Other brands like Starwood Hotels have since used Uber for similar marketing promotions.